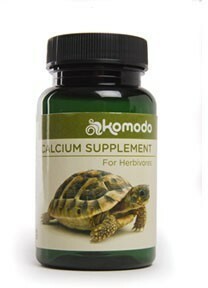 Details: KOMODO CALCIUM SUPPLEMENT FOR HERBIVORES 135G Komodo Calcium Supplement for Herbivores contains a broad spectrum of vitamins and minerals with extra calcium and phosphorus to help provide a balanced diet for herbivorous animals. It is the ideal supplement for vegetarian animals receiving natural or artificial UVB light and therefore requiring minimal levels of additional D3. Herbivore Supplement is specially designed to apply to fresh vegetables and fruit.